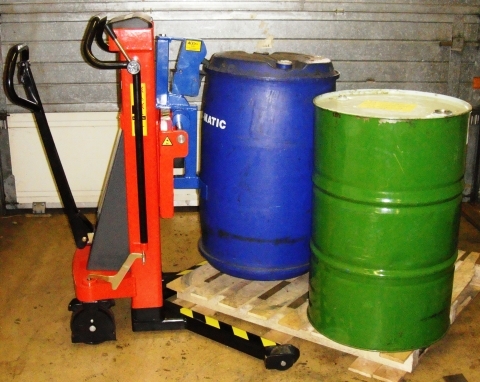 Grab-O-Matic Model: SC21 ’V’ Type – Manual pedestrian drum carrier for the removal of drums from the corners of pallets. Fitted with a quick release removable rim grip drum grab attachment for all steel drums, plastic ‘L’ ring drums and most fibre drums. 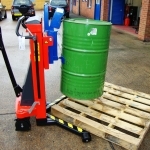 The ‘V’ type legs allow the unit to remove a drum from each corner of a pallet of 4 drums, move around a workshop and place onto the floor, pallet or bund. The drum grab attachment (model QR-HD-1) grabs the drums on the top rim when the carriage is raised by the manual hand pump and will not release the drums until set to the ground. The unit is available in various lift heights and also power lift and power drive versions. 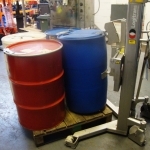 A stainless steel pedestrian drum handler for use in clean room areas. 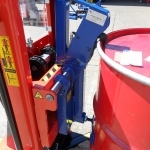 Drum handler gripping head attachment for all steel, open top, tight head and plastic L-ring drums. 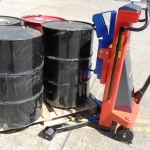 Can remove a single drum from the corner of a pallet of four drums. 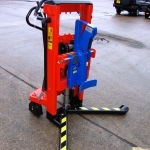 The unit is available in manual lift and power drive and lift options. A Standard S21-V can lift a maximum of 500MM. 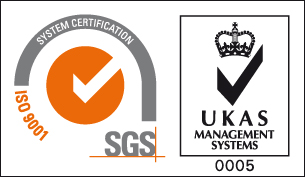 Other lift heights available.